Hi everyone! I’m Bunny Mickley. 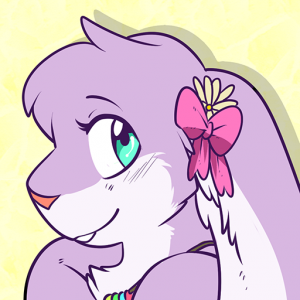 I’m one of the co-directors of Mephit Fur Meet, and I’m responsible for registration. 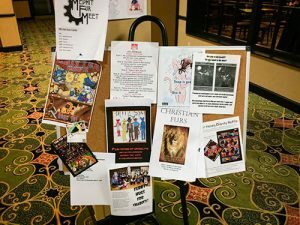 Because of that, I get a few emails every year from new people coming to MFM for the first time, and I want to share a bit about what I love about Mephit Fur Meet, and some tips for what to expect at your first MFM. Mephit Fur Meet is kinda unique. We have our own way of doing things, and it’s a bit different than everyone else. Let’s start out with the most frequently asked question. Not even close! In fact, roughly only 20% of the people at any furry convention (MFM included!) will have a fursuit, and you’ll rarely see people in them the whole time. You will not be out of place not being in ‘suit, don’t worry. People inside of fursuits get really hot. Like, super-duper hot. I mean, they’re wearing a bunch of yards of thick fur, and usually have some sort of foam head. (Some suits, like mine, have a resin head, but either way – there’s little places for body heat to go.) It’s really hard to go a long time in one without a lot of practice and experience working up towards it. It’s usually okay to interact with fursuiters. But please, ask them first if they’d mind, and bear in mind that not everyone will talk while in suit, so look for non-verbal answers. A lot of fursuiters are playing a character, and are very proud to do it. Most will happily talk to you or pose for photos. I sure do! (I even spent a lot of time taking selfies so that I can figure out what looks the cutest on camera, but that’s a different story…) Putting on a fursuit and being a different character than you normally are is part of the fun. One thing that might not be obvious to anyone that hasn’t worn a fursuit before is that it’s usually hard to see out of them. Fursuiters usually have really limited side and bottom vision, so approach them directly from the front so they can see you. I wear glasses full time normally, but I can’t while in suit (they just fog up instantly), so I’ve got that going for me, too. I’m not the only person like this. We do our best to feed you! Most cons don’t do this, but we do. There’s one food event per day, but it’s usually not enough to sustain you for a full day. We sometimes run out, too, but we try. Tyger and his crew in the Critter Cafe do an amazing job cranking out snacks and stuff. 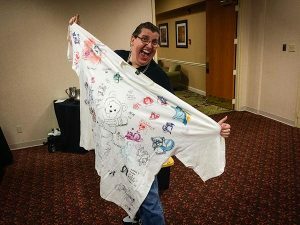 Our con suite is open to anyone that registers, not just upper-level memberships. It’s something we do that’s different, but we’ve always done it that way, and we’re happy to do it. We don’t want to be the biggest con ever. There’s lots of big cons, and they’re wonderful. I attend a few a year myself! But not everyone enjoys large crowds… including me. I personally like smaller cons where I can actually meet people, and don’t have to deal with huge lines. (Yay, introverts!) If we got much bigger than we currently are we’d have to find another hotel, or have several hotels, and it just wouldn’t be the same. If we got too big, we wouldn’t be the same MFM we all know and love, and we don’t want that. There’s no such thing as a “best” con, because everyone likes different things. Some people like giant cons with non-stop action all night and thousands of other people, and that’s great. Some other people like smaller cons that settle down at night and have a not-so-large number of people there, and that’s great, too. That’s what we try to be – an alternative for people that want a smaller, fun, and kinda quirky con. We have weird traditions, and we don’t even know why. Like any family reunion, there’s just weird stuff that we do, and no one can remember why we do it. It’s just part of the fun. For example, we have this odd tradition of the Directors throwing plastic ducks into the crowd before opening ceremonies. No, I have no idea why we do this, but you can better believe I look forward to Tyger handing me a little plastic baggy full of ducks while we’re in the waiting room, waiting for Opening Ceremonies to start. We raise a lot of money for our charity. Most furry conventions, including ours, have a charity that we help support. Ours is Tiger Haven, which is a privately-run sanctuary for large cats. They take in large cats that have no other place to live, and give them shelter and safety. We’ve partnered with Tiger Haven for so long now that they just feel like a normal part of the MFM family. There are different events during the weekend to raise money for them, with the largest being the Charity Auction. Make sure you go to that! It’s a lot of fun to watch the items that are donated for sale, and the bidding process of them getting sold. You’re going to meet people from all sorts of walks of life. Furry is a giant melting pot. There’s people from all over here. The common thing we share is that we’re all fans of animals. If ask ten furs what furry means, you’ll get 12 different answers. Furry means something different to everyone. I mean, you don’t have to. No one will be pressuring you to do so, nor will they judge you if you don’t, but if you do, you’re likely to learn some really cool new things. MFM is a pretty safe place to learn new things about yourself and the world around you. The first time I realized that I was in a hotel full of furries, and people that weren’t furs were the weird ones, it was just amazing. I felt so at home and like I belonged. I never wanted that weekend to end.